If God’s Word is to be heard, we who love it must stand in its defense, says James R. White in his introduction to Scripture Alone. With clear teaching in an engaging, accessible style, this book lays a foundation for all Christians who desire a deeper understanding of biblical sufficiency. White presents Scripture as God-breathed in nature, as unparalleled and absolute in authority, and as the church’s infallible rule of faith in straightforward language to help believers apply these doctrines to their lives. In addition he addresses the timely issues of the canon, including textual and historical evidence. The captivating dialogues used throughout the book help bring into focus the great truths of faith against the backdrop of error. Based on the author’s experience in public debates against leading apologists of varying ideology, they assist readers in discovering how to engage in conversation with those of differing beliefs. James R. White is the author of several acclaimed books, including The King James Only Controversy and The Forgotten Trinity. He is an elder of the Phoenix Reformed Baptist Church, director of Alpha and Omega Ministries, a Christian apologetics organization, an adjunct professor with Golden Gate Baptist Theological Seminary, and a professor of apologetics with Columbia Evangelical Seminary. He and his family live in Phoenix. “Scripture Alone by James R. White had me hooked at the Dedication page. The heart for Christ that is briefly exposed there is more full expressed in the subsequent pages. White states in his Introduction that he is passionate about theology and faith, and that passion is clear throughout the book. The Introduction also contains a helpful clarification of sola scriptura (and sola fide), which is laid out in more detail in Chapter 2; there are several useful historical references as well. Chapter 2 concludes with an assessment of the evangelical church’s view of Scripture and preaching, in theory and in practice. This is a book that is written for the layman, but I confess to getting a bit bogged down in Chapter 5, a discussion of the canon of Scripture. I am confident that this is a problem that can be easily overcome by a slower, more careful reading on my part. Throughout the book, White employs a dialogue technique that proves helpful in most places, but occasionally gets tedious. Chapter 6 provides a good preview of material that most Christians have not read firsthand in their entirety, but may have had to deal with recently because of the popularity of The Da Vinci Code. Though not primarily a rebuttal to that book, it is helpful. Chapter 7 has an excellent imaginary debate between a Christian and a Mormon about text corruption, as well as a transcript of an actual debate between White and a Muslim that was wonderful. White also addressed one of my pet peeves in ‘The Lord spoke to me, saying…’ However, the ending he portrays with George happily agreeing to consider Joshua’s points has been a rarity in my experience. Chapter Six: Did Thomas Write a Gospel? “And they cried with a loud voice, saying, How long, O Lord, holy and true, dost thou not judge and avenge our blood on them that dwell on the earth? And white robes were given unto every one of them; and it was said unto them, that they should rest yet for a little season, until their fellowservants also and their brethren, that should be killed as they were, should be fulfilled” (#Re 6:10,11). “Our God shall come, and shall not keep silence: a fire shall devour before him, and it shall be very tempestuous round about him ” (#Ps 50:3). The first of the foregoing passages gives us the cry of martyred souls John saw under the altar in the heavenly temple. Their appeal is for justice against their murderers. Here is proof that the soul does not lie in unconscious sleep during the intermediate state. These souls are conscious. They cry for Judgment to fall upon the earth. In response to their cry, they are given white robes, indicating that they are justified in their desire for vengeance on the wicked. While on earth the saint is to pray for his enemies, but after death he may pray against them. These martyred souls are told that they must rest until the martyrdom of all the others, who are to be killed, shall have been accomplished. All this indicates that this dispensation of mercy is to end in bitter persecution of the people of God. It would seem that there are days of martyrdom ahead for the saints as well as behind. And nobody knows when he may be called upon to seal his faith with his blood. Who knows but that in the near future some governmental decree might put us to the test as to whether we will obey God or man? The second text is a sequel to the first. It points to the time when the cry of the martyr is heard and vengeance is executed. “Our God shall come, and shall not keep silence; a fire shall devour before him, and it shall be very tempestuous round about him” (#Ps 50:3). It looks to the time when the longsuffering of God is at an end, and Christ comes in judgement, “In flaming fire taking vengeance on them that know not God, and that obey not the gospel of our Lord Jesus Christ” (#2Th 1:8). A silent heaven is the greatest mystery of our existence. A slient heaven is the greatest trial of the faith of the saint. The atheist does not believe in the possibility of miracles because he does not believe in the existence of a personal and powerful God. The believer’s problem is the absence of miracles. As a believer in a personal and powerful and loving Heavenly Father he cannot understand why miracles are not common today. If there is a God why does He allow things to be as they are? Why does He not step in and put down all the wrong and rebellion that covers the face of the earth? Why does He suffer the wicked to oppress the righteous? If there is an almighty God, why doesn’t He do something? is the despairing cry of many a mother whose son wades the mud and fights on foreign soil. How is the existence of a good and powerful God consistent with such a long period of silence in the face of the defiance of His enemies and the cries of His people? If there is a personal and all-powerful God, why do the righteous suffer and the wicked prosper? In the face of these questions the infidel plies his trade and the believer is filled with anxiety and perplexity. In the days of Moses God was so manifestly at work in performing miracles that even the wicked magicians of Egypt had to confess, “Then the magicians said unto Pharaoh, This is the finger of God: and Pharaoh’s heart was hardened, and he hearkened not unto them; as the LORD had said” (#Ex 8:19). And in the days of our Lord’s earthly ministry miracles were common and were not even disputed by His enemies. Christ’s miracles made Him famous, but they won no genuine converts. “But though he had done so many miracles before them, yet they believed not on him:” (#Joh 12:37). “Now when he was in Jerusalem at the passover, in the feast day, many believed in his name, when they saw the miracles which he did” (#Joh 2:23). Those who believed because of what they saw could not be trusted. Miracles continued through the days of the apostles, but became less common towards the close of the apostolic age. The gift of miracles, was sovereignly bestowed upon and distributed among the members of the early churches. It is obvious that we do not have public miracles today at least in such unmistakable manner as in ancient times. I know there are people today who claim to be able to perform miracles of healing and talking (their claims are usually limited to these two things), but there is something so manifestly lacking in their so called miracles that their claims are not above suspicion. And when they are investigated there is room for question, which was not the case in the days of Christ and the apostles. There is a problem in the silence of God. When Peter was in jail waiting to be executed, God sent an angel to deliver him. “And suddenly there was a great earthquake, so that the foundations of the prison were shaken: and immediately all the doors were opened, and every one’s bands were loosed” (#Ac 16:26). And Paul was miraculously delivered at Philippi. But since those days millions of saints have been martyred, and their cries for deliverance have not been answered. The heavens above them have been as brass. “And Pharaoh said, Who is the LORD, that I should obey his voice to let Israel go? I know not the LORD, neither will I let Israel go” (#Ex 5:2). God accepted the proud monarch’s challenge and demonstrated His power over him in terrible judgments; but in these days men challenge and even ridicule the very idea of a personal God; and heaven says not a word. Charles Smith, and other theoretical atheists have just about used up all the bad words in decrying religion, denying God, and heaping abase upon the Bible; and to all their bombast God is silent. God’s silence in the face of defiant foes, challenging Him to combat, can be explained. God’s silence to the cries of His helpless children does have an explantion. What is it? 3. It is not because God does not know. The omniscience of God is one of the sweetest attributes to the believer. One of the sweetest psalms of David is the one hundred and thirty ninth in which he celebrates the omniscience of God: “O LORD, thou hast searched me, and known me. Thou knowest my downsitting and mine uprising, thou understandest my thought afar off. Thou compassest my path and my lying down, and art acquainted with all my ways. For there is not a word in my tongue, but, lo, O LORD, thou knowest it altogether. Thou hast beset me behind and before, and laid thine hand upon me. Such knowledge is too wonderful for me; it is high, I cannot attain unto it. Whither shall I go from thy spirit? or whither shall I flee from thy presence? If I ascend up into heaven, thou art there: if I make my bed in hell, behold, thou art there. If I take the wings of the morning, and dwell in the uttermost parts of the sea; Even there shall thy hand lead me, and thy right hand shall hold me. If I say, Surely the darkness shall cover me; even the night shall be light about me. Yea, the darkness hideth not from thee; but the night shineth as the day: the darkness and the light are both alike to thee. For thou hast possessed my reins: thou hast covered me in my mother’s womb. I will praise thee; for I am fearfully and wonderfully made: marvellous are thy works; and that my soul knoweth right well. My substance was not hid from thee, when I was made in secret, and curiously wrought in the lowest parts of the earth. Thine eyes did see my substance, yet being unperfect; and in thy book all my members were written, which in continuance were fashioned, when as yet there was none of them. How precious also are thy thoughts unto me, O God! how great is the sum of them! If I should count them, they are more in number than the sand: when I awake, I am still with thee. Surely thou wilt slay the wicked, O God: depart from me therefore, ye bloody men. For they speak against thee wickedly, and thine enemies take thy name in vain. Do not I hate them, O LORD, that hate thee? and am not I grieved with those that rise up against thee? I hate them with perfect hatred: I count them mine enemies. Search me, O God, and know my heart: try me, and know my thoughts: And see if there be any wicked way in me, and lead me in the way everlasting.” Here is a good way to test my spirituality. Am I glad that God knows all about me? It does make me happy to know that He knows how I hate sin and struggle against it. He knows that His people are hungering and thirsting after righteousness, “Blessed are they which do hunger and thirst after righteousness: for they shall be filled” (#Mt 5:6). Yes, He will fill us with goodness, for He Himself created this hunger within us. Some sweet day every saint will be as good as he wants to be. 4. God’s silence does not mean that He has vacated His throne. God is still on His throne. He is still reigning, and working all things after the counsel of His own will. But He is not ruling openly and publicly. He is staging the drama of human history from behind the scenes. His reign is secret rather than public. He rules through Providence and Providence is always mysterious. “O the depth of the riches both of the wisdom and knowledge of God! how unsearchable are his judgments, and his ways past finding out” (#Ro 11:33). The finger of God is at work today, but the world does not see it. He is performing miracles today, but not of a public character. 5. God’s silence is not due to the lack of faith on the part of His people. This is not the reason for the absence of public miracles today. We are often told that if God’s people had the faith of Peter and Paul and other early saints, that miracles would be as common now as then. We do not believe it. We are not arguing that any of us has the faith he ought to have, but this is not the reason for lack of miracles. Miracles were limited to the time of witnessing to Israel as a nation, and when the nation was turned from and the Gentiles were turned to, miracles ceased. Miracles were for the purpose of accrediting Christ to the Jews as their Messiah. Miracles were Christ’s credentials to His people Israel. We give one incident to illustrate this: “And there came a leper to him, beseeching him, and kneeling down to him, and saying unto him, If thou wilt, thou canst make me clean…And saith unto him, See thou say nothing to any man: but go thy way, shew thyself to the priest, and offer for thy cleansing those things which Moses commanded, for a testimony unto them” (#Mr 1:40,44). In this way he would be witnessing to the nation, through its priesthood, that there was one among them who could cure leprosy, and therefore, must be their Messiah. In spite of all the miracles, attesting the presence of their Messiah, the nation rejected Christ in His personal ministry and in the ministry of His apostles and then public miracles ceased. 2. Miracles are not necessary to prove God’s love for sinners. We have no right to ask God to perform miracles in proof that He loves us. The very request for such proof would be unbelief. We have His word that He loves sinners, and if we take the place of sinners and trust the Savior He has provided, we may be sure that He loves us. God has given ample proof of His love for sinners in giving His Son to die for them, “In this was manifested the love of God toward us, because that God sent his only begotten Son into the world, that we might live through him. and to perform a miracle for that purpose would be to put a premium on unbelief” (#1Jo 4:9). Miracles did not save anybody in the days when they were common. Judas lived with Christ and saw most of His miracles, but he was not saved. Where most of His mighty works were done, the people were rebuked for their unbelief. Of the people of Jerusalem it is written: “But though he had done so many miracles before them, yet they believed not on him” (#Joh 12:37). 3. Public miracles have usually been associated with judgment. The miracles of Egypt were miracles of judgment. And miracles in the future are to be associated with judgment. When God gets ready to judge this wicked world, then he will begin to work miraculously. The finger of God will again appear on the earth. “Our God shall come and shall not keep silence” (#Ps 50:3). He now manifests Himself to His people they see His miraculous hand in their affairs, but He hides Himself from unbelievers. His word satisfies His people, and He will not satisfy the idle curiosity of the wicked with miracles. 4. The Bible reveals that there will be miracles of a public nature during the last days of this dispensation, but they will be of the devil and not of God. Our Lord, in speaking of the signs of His coming, said “For there shall arise false Christs, and false prophets, and shall shew great signs and wonders; insomuch that, if it were possible, they shall deceive the very elect” (#Mt 24:24). The word for “sign” in the passage is the same word usually translated miracle. “And he doeth great wonders, so that he maketh fire come down from heaven on the earth in the sight of men, And deceiveth them that dwell on the earth by the means of those miracles which he had power to do in the sight of the beast; saying to them that dwell on the earth, that they should make an image to the beast, which had the wound by a sword, and did live” (#Re 13:13,14). In #2Th 2:9: “Even him, whose coming is after the working of Satan with all power and signs and lying wonders” we learn that the coming of the “man of sin” will be after the working of Satan with all power and signs (miracles) and lying wonders. If there is anybody performing miracles today, the gift is not from God, but from Satan, and is a sign of the end time. There is a clamor today in religion for the miraculous and sensational and spectacular. And this is because people tire of the word of God. People who are looking for miracles as a sign or proof of God’s presence and favor are putting themselves in a good position to be deceived. What is supernatural is not necessarily Divine. This is the day of salvation, not the day of judgment. This is the day of the longsuffering of God. The only person who has the right to judge is Christ, and He is now on the throne of Grace. When He next breaks the silence it will be to speak in wrath and let loose the judgments that shall engulf the world. “Our God shall come and shall not keep Silence” (#Ps 50:3). He is silent now, in this day of grace, so far as the public manifestation of Himself is concerned, but the day is coming when He shall speak unto them in His wrath and enemies to be made His footstool. He has spoken the last word to vex them in His sore displeasure. “Why do the heathen rage, and the people imagine a vain thing? The kings of the earth set themselves, and the rulers take counsel together, against the LORD, and against his anointed, saying, Let us break their bands asunder, and cast away their cords from us. He that sitteth in the heavens shall laugh: the Lord shall have them in derision. Then shall he speak unto them in his wrath, and vex them in his sore displeasure. Yet have I set my king upon my holy hill of Zion” (Psalm 2). Yes, but it is not the silence of a helpless and defeated God. A silent heaven! Yes, but it is not the silence of a callous and indifferent Father. A silent heaven! Yes, but it is not the silence of a Father who forgets His children. It is the silence which is the pledge and proof that the way is still open for the guiltiest sinner to draw near to God in Christ. It is the assurance that we are still living in the day of salvation. When the believer faints, and the infidel revolts, and men beg God to break His silence and show His hand on the earth, they little realize what that will mean. It will mean the withdrawal of amnesty; it will mean the end of the reign of grace; it will mean the closing of the day of mercy; it will mean the shutting of the door to the Ark of salvation; it will mean the dawning of the day of wrath, the day of the revelation of the righteous judgment of God. “Knowing therefore the terror of the Lord, we persuade men; but we are made manifest unto God; and I trust also are made manifest in your consciences” (#2Co 5:11). “Because there is wrath,” we would warn men to flee the wrath to come. “Neither is there salvation in any other: for there is none other name under heaven given among men, whereby we must be saved” (#Ac 4:12). God has spoken to us in His Son. We have the message about His Son in the Bible. It tells us that eternal life is in Jesus Christ. It tells us that the Son was punished that sinners might not perish. Despise this message and reject the Son, and when God speaks again you will hear Him speak in tones of judgment. “I am come a light into the world, that whosoever believeth on me should not abide in darkness. And if any man hear my words, and believe not, I judge him not: for I came not to judge the world, but to save the world. He that rejecteth me, and receiveth not my words, hath one that judgeth him: the word that I have spoken, the same shall judge him in the last day” (#Joh 12:46-48). “It seems odd, that certain men who talk so much of what the Holy Spirit reveals to themselves, should think so little of what he has revealed to others.” – C. H. Spurgeon, Commenting and Commentaries (London: Passmore & Alabaster, 1876), 1. I received your most welcome note, and beg pardon if you think me negligent in returning thanks. I have been busily employed every Lord’sday; not at home once yet, nor do I expect to be this year. Last Sunday, I went to a place called Waterbeach, where there is an old-established Church, but not able to support a minister. I have engaged to supply to the end of the month. They had, for twenty years, a minister who went over from Cambridge in the same way as you go to Toilesbury. After that, they tried to have a minister; but as they could not keep him, he has left, and they will have to do as they used to do. There is rail there and back, and it is only six miles. I trust that you are all well, and that the clouds are blown away. I am quite well, I am happy to say. Where is Aunt? It is four months since I have heard anything from her, or about her. We have no settled minister yet, nor do we expect any. I thank you much for your sermon; it will just do for me. How greatly must I admire the love that could choose me to speak the gospel, and to be the happy recipient of it! I trust my greatest concern is to grow in grace, and to go onward in the blessed course. I feel jealous lest my motive should change, fearing lest I should be my own servant instead of the Lord’s. How soon may we turn aside without knowing it, and begin to seek objects below the sacred office! 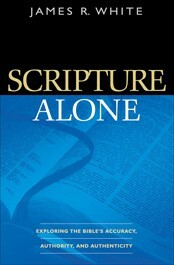 Download part of the book ‘Scripture Alone’ as a Pdf. From The Presbyterian Banner: July, 1996. Roman Catholic apologist, Mr Patrick Madrid in June, 1996. Our subject is a large one and we can hardly give adequate coverage in the time allowed, but hopefully the main points can be addressed. For the purpose of this debate the question is not ‘Does Scripture contain in one form or another all that is necessary to salvation? [material sufficiency], for on this I understand Mr Madrid and I are agreed, but ‘Is Scripture a sufficient and final court of appeal in matters of faith or morals?’ [formal sufficiency]. Fundamentally, therefore, we are dealing with the question of authority in regard to the Christian faith. The Roman Catholic position is that the Church is the custodian of revelation whether in the form of oral teaching or written Scripture and that the Church has an infallible teaching authority or magisterium which is essential in order for us to know both what writings are Scripture and the correct interpretation of their content. Although this is not an infallible declaration it reflects much of what was said by the Council of Trent in 1546, which is regarded as infallible. Today also, in current exegetical work by Roman Catholics, it is abundantly clear that dogma as defined in Sacred Tradition is what binds and not Scripture in its simplicity. 4. Scripture is a sufficient and final court of appeal in matters of faith and morals.